Our achievements are best shown by results such as millions of tons of produced and exported stone aggregates , hundreds of thousands of cement imported and distributed in Montenegro, thousands of tons of produced and sold in domestic and foreign markets building materials of brand "Sandenit" and thousands of ships which port's agent at port of Bar we were. Nimont has won award by Montenegro Bussines Alliance for best private company in Montenegro for 2004. Nimont has been declared the best SME company for 2006 in Montenegro by Directorate for development of small and medium-sized enterprises. 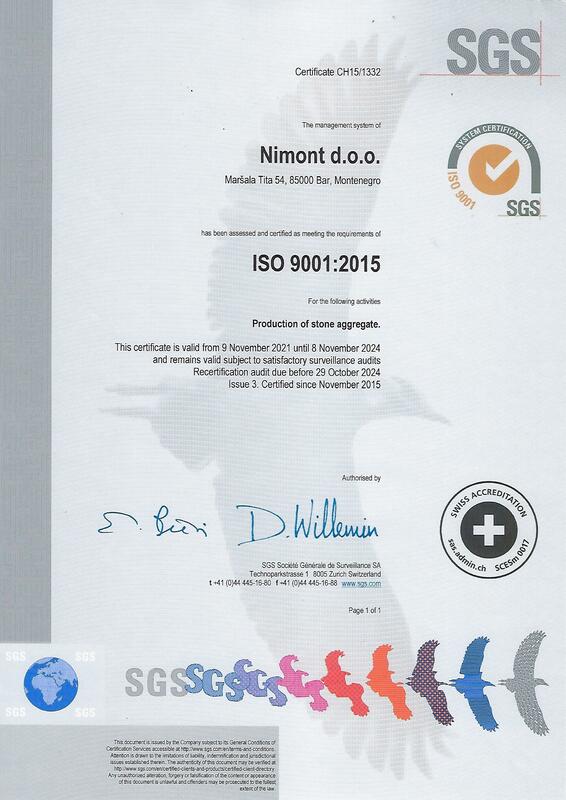 In order to keep and improve quality of our goods and services, we adopted ISO standard 9001:2008 which has been certified by SGS. Our products are fully harmonized with EU directives which allows us to use CE mark and to export to very competitive European markets. Naš sertifikat možete pogledati klikom na sliku na desnoj strani. Our continuing success is based on three main factors: ability to predict trends and market requirements and willingness to build strong, innovative and adaptable team of specialists, managers and staff and most importantly to maintain quality of products and services at the highest level in order to keep existing and obtain new customers.